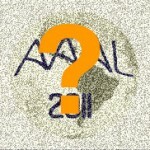 What are your hopes for AAAL? Anyone who’s interested in language in society might want to take a look at the May 2009 issue of Text & Talk, with articles on Dell Hymes by Jan Blommaert, Nancy Hornberger, Susan Ervin-Tripp, Ron & Suzanne Scollon, Ben Rampton and others. I got the original link from LinguistList. Professor Sige-Yuki Kuroda, a great thinker and peerless linguist, left us on February 25, 2009. An events dilemma: Gaby or Silverstein? Are you on the Linguist List? btw slumdog is getting some heat from within India for forefronting the only aspect of Indian life that ever “entertains” others: slum life.